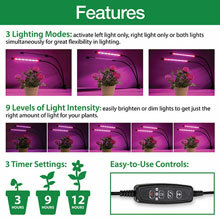 This Grow Light has the following specifications- 36 total lamp chips in total, with 24 red lights and 12 blue lights. Red wavelength is at 660 nm while the blue wavelength is 460 nm. 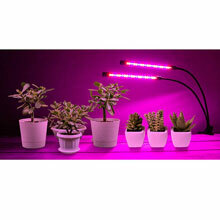 Each light is scientific and measured accordingly for optimal plant growth. 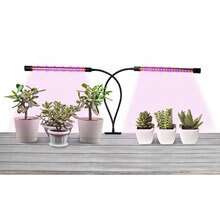 The Grow Light can be used for food production, plant propagation, indoor gardening, indoor hydroponics and horticultural applications. 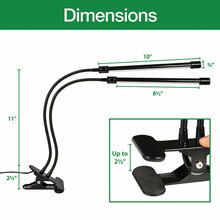 Overall: 10½" long lights, 15" adjustable gooseneck neck, 3" wide clip and 50" long USB cord with plug adapter. 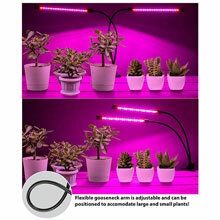 •PERFECT GROW LIGHT SPECTRUM: This grow light adopts with high brightness 24 pcs red LED (660 nm wavelength) + 12 pcs blue LED (450 nm wavelength), give off perfect wavelength for all growing stages. Red light facilitates the synthesis of plant carbohydrates and accelerate plants' development. Blue light increases chloroplast activity and effects a lot on photosynthesis. Suitable for seeding, germination, vegetative & flowering. •MULTIPLE USES: Suitable for indoor plant seedlings grown in a hydroponic greenhouse at your home or you placed in your office. 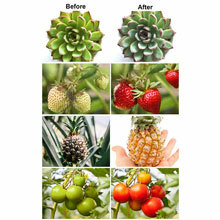 It helps to speed up the growth of potted plants, flowering plants, foliage, and succulent plants. 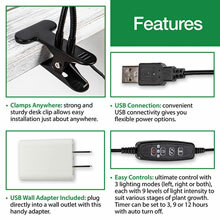 •EASY TO USE: With the USB design, you can plug into a wall outlet UL listed plug, 110 V-220 V or an USB interface. 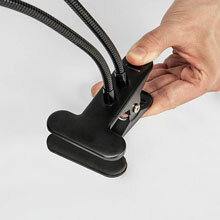 The dual-lamp with 360-degree flexible neck and clamp is easy to adjust and place anywhere. 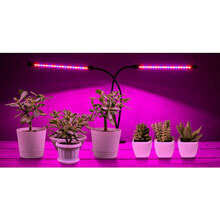 The Wide linear light style allows it to cover a larger area and supply energy to more plants. 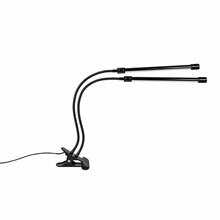 •PRACTICAL DESIGN: 3 modes: left light, right light, or both lights, each mode allows you to cycle though 9 levels of light intensity, also comes with three timer setting options which allows up to 3, 6, or 12 hours according to plant needs. 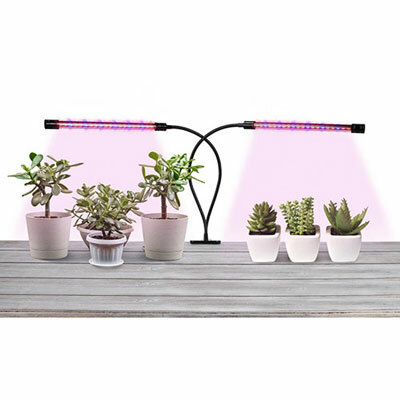 •PERFECT FOR WIDE VARIETY OF PLANTS: This plant grow light is perfect for all kinds of flowering plants including tomatoes, chili, eggplant and roses, all kinds of greens including herbs and leafy vegetables, lettuce and all kinds of succulents.